Have you ever wonder about getting those professional treatments for your skin by just doing it at home? Where to get them? 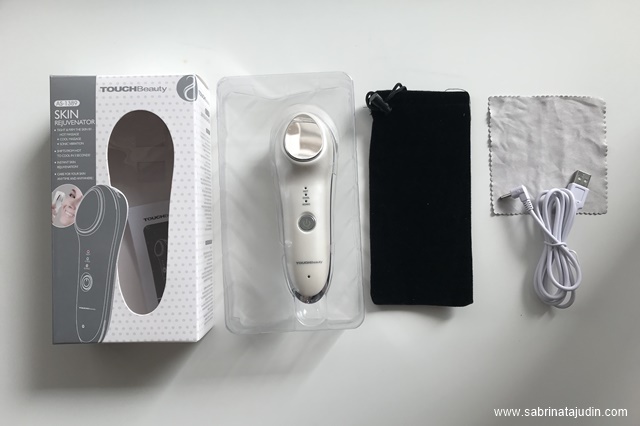 Touch Beauty Malaysia is a leader in beauty & personal device care that offers a wide variety of beauty device that you can explore. From face massager, eyebrow trimmer, and many more. 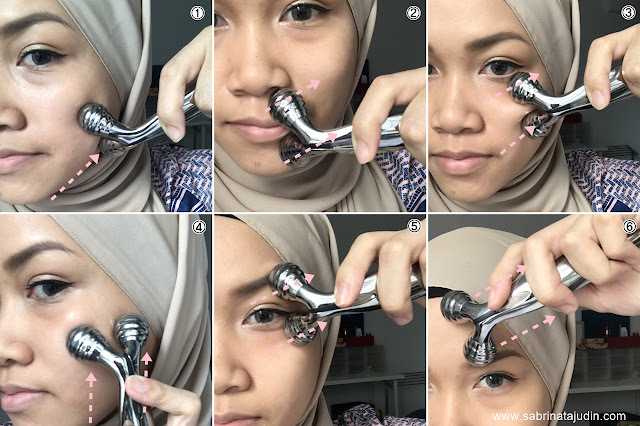 These kinds of tools help to enhance and give a better result for your skin and also skincare application. I can never have time to go to the spa, I'm always occupied with my business, family and especially my clingy son who follows wherever I go, haha. So I give myself a try of these 3 picks from Touch Beauty Malaysia. All devices are wrapped up perfectly and shipping is very fast. Excellent! On every purchase, you will get a free towel, either pink or white that will be given randomly. 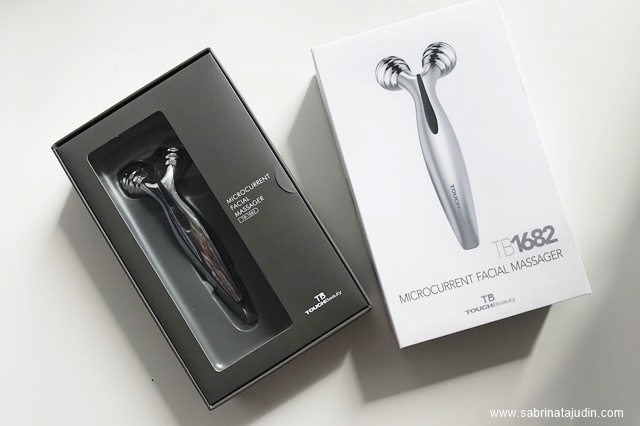 I got my self the Microcurrent Facial Roller, Hot Cool Skin Device, & the Sonic Eye Device. Now let's get on to the review on each device. This is a skin rejuvenation secret device that helps skin to look youthful and improve the skin. It is a Spa-grade anti-ageing technology. By just looking at it, I can tell that this device is very handy and easy to use. Its ergonomic shape & wireless feature can help users use it easily, anywhere & anytime. Unboxing the box, there is the device itself, a velvet pouch for travelling, a USB charger & a wiping cloth to wipe off the surface of the device after each use. 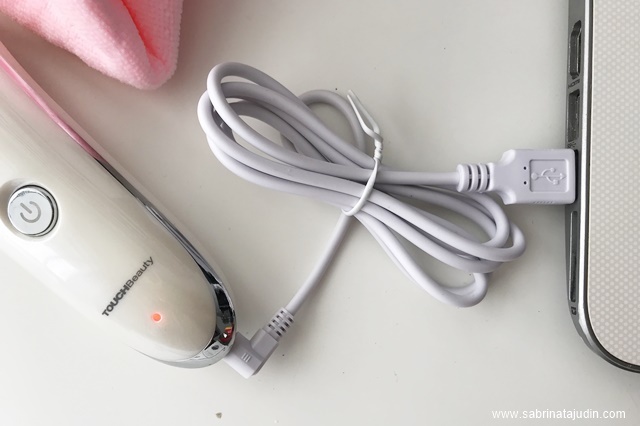 It is easily charged using any USB port that you have. I just charge it using my laptop, and within 1 hour, it is fully charged. The red button will start blinking when it is charged. It said that, after fully charged, this device can be used around 40mins. It comes with one simple button. Simple hold for 3 seconds to turn it on. It will start with the Warm treatment (red light). The warming up took just seconds and the temperature will max up to 42 Celsius. The Hot temperature helps to replenish nutrients and maximizes absorption of moisturizers and provide deep hydration to the skin. It helps open up pores for better skincare absorption. 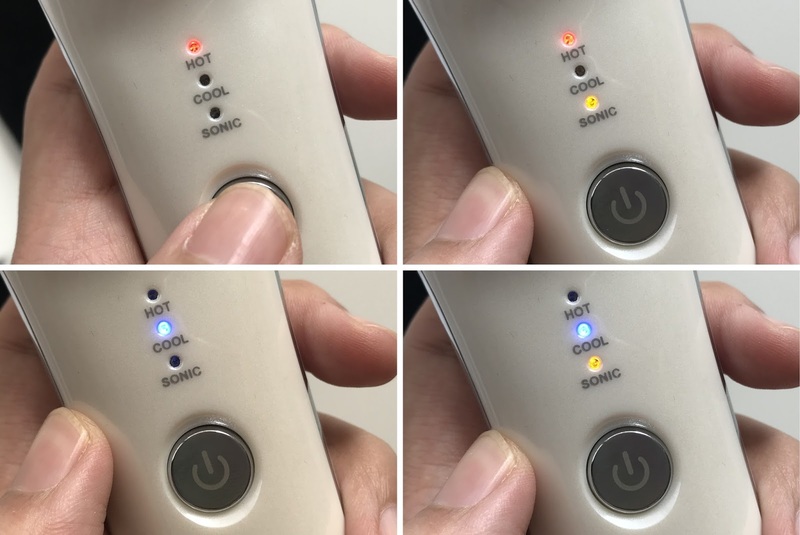 Simple click again to turn on the sonic vibration while using the warm treatment (red & yellow light). This helps to enhance the rejuvenation process. Click for the 3rd time and it will turn into the Cool treatment. A blue light will appear. The cool mode is maxed 6c. This helps to diminish wrinkles & fine lines. It's very cooling & soothing. I really love it. It helps to close up pores too. Then click again to turn on the sonic vibration mode while using the cool mode (blue & yellow light). The transition between warm & cool is very fast. You don't need to wait. I like that! When in the cool mode you can see these "cloudy" appear on the massaging surface. Pretty cool. I also love the water-dropped shape of the massage surface. It reaches out my whole entire face easily. How I use it, I apply my moisturizer on to my skin. You can use it for serum, toner and other skincare too. Then turn on the device. 1st session is the hot treatment for 2.5mins. It actually has a self-timer which will alert you that the first session of 2.5min is done. The click again for the cool treatment for 2.5mins. Gently in a circular motion and let the skincare absorbs. It has a built-in ventilation hole to make sure the temperature does not stay in the device. 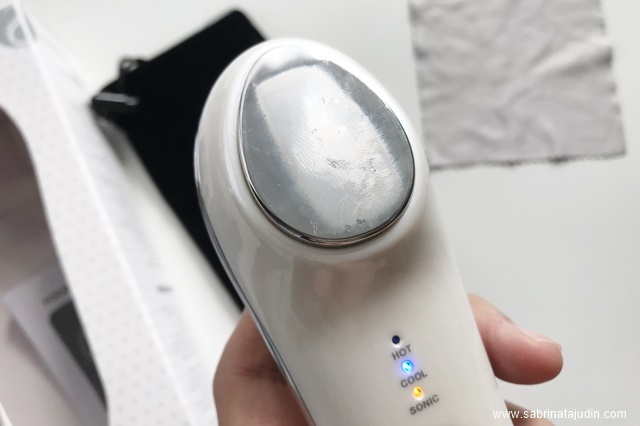 After using it, simply wipe off any excess of your skincare to keep it clean. It comes with a black velvet pouch for traveling. I always have puffy eyes due to lack of sleep and hours of working in front of the computer. 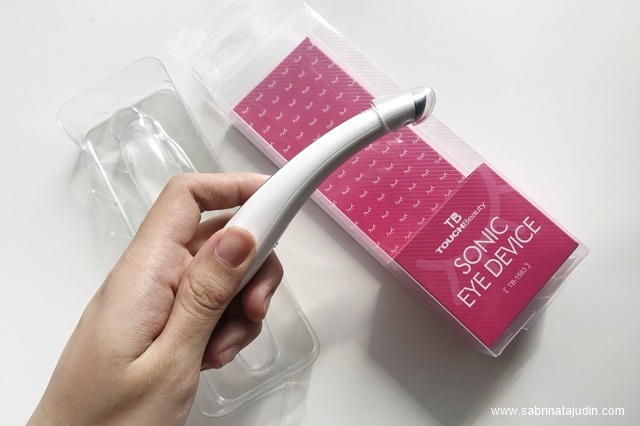 This Sonic Eye Device helps to revitalize the delicate skin under the eyes. It helps to soothe & refresh the skin for a brighter appearance. It is specially made for facial and eye massage. It can also be used not only on the eye area but also to treat smile lines. This device is very handy and fits right on the hand. It is battery operated, batteries do not include for the device. But you can simply purchase one normal AAA battery for this. 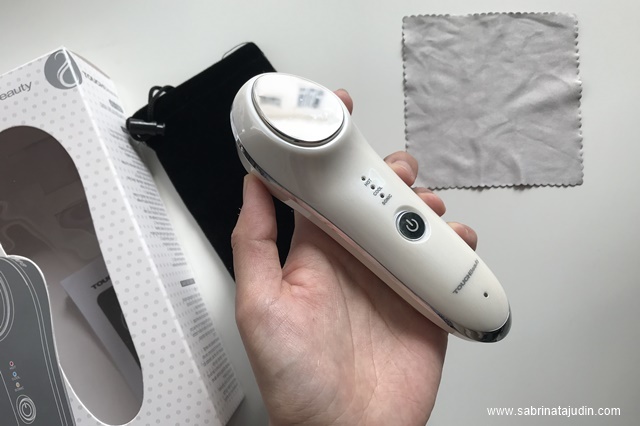 You can use the device to pick up eye cream or gel. This is great because you can avoid nasty bacteria on your products especially eye cream that comes in a jar. 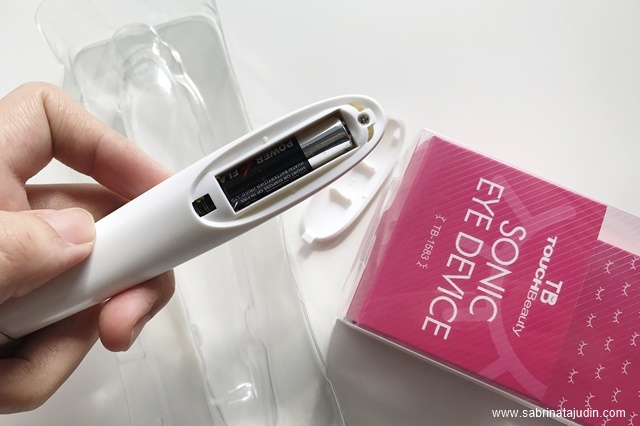 1st, Apply the eye cream around the eyes, then gently apply the Sonic Eye Device around the eyes in outer motion. Press & hold for 10 seconds at points around the eye. Repeat 2-3 times. Then lastly, gently apply eye massager surf around your eyes 3-5 times. My illustration is a bit straight forward, I don't know how to make a curve shape for the arrow haha. The application should be rounded around the eye area ok! 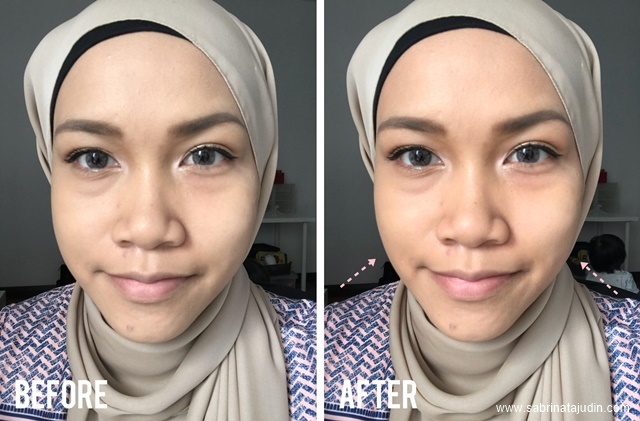 I was also impressed on how it depuff my eyes in just one application! As you can see from the image below, I do have eye bag problem, and after using it, it does reduce it abit! Created by a famous beauty expert, Chiaki Murata. A fighting anti-ageing signs device that does not need any charging or even battery! It can be used for the whole body to help tighten skin, remove cellulite and helps to give you a slimmer face and body. Sounds interesting! All you need is to roll on targeted areas as shown. 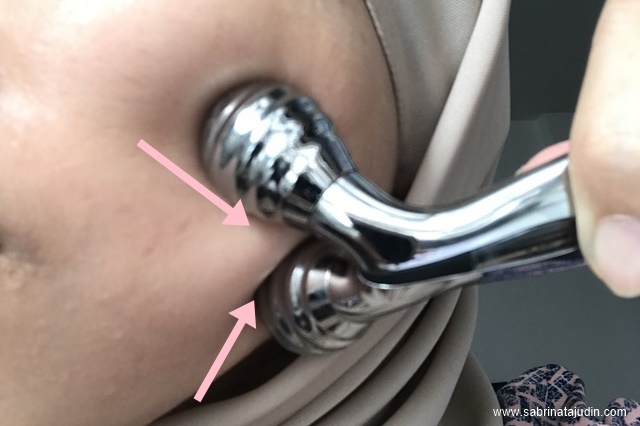 It has a special V shape with 70 degrees lifting complex that helps tighten the skin. The rounded edge also moves 360 degrees for that lifting effect. As you can see from the image below when you roll it, it kinda "pinched" to the centre to helps the lifting effect outwards. Here is a demo on how to use it for the face area for a more slimming & lifting effect. 1. Moving upwards from the chin area to your jawline. The lower part of the edge will help to lift the double chin and lift your upper chin area. 2. The moving upwards to the part below your nose and lower lip upwards. 3. Then to the center part of your chin (cheekbone area) where the upper part of the roller under your eye area. Move upwards. 4. Sweep up to lift up sagging skin, starting from the cheek and towards the temple. 5. Then the eye area. The lower part will help to lift under the eye and the upper part will lift the eyebrow area. 6. The on the forehead area, simply roll upwards from the center to the upper head area. 7. You can continue using it on your neck area too. Here is the before & after. As you can see my cheek area is less sagging and firmed up. It can not only be used for the face as I show, but it can also be used for the leg, armpit & arm. Overall I am loving each device that I got. My favorite has to be the hot cool massager. It is so relaxing & soothing. You can find out more products at their official website. Purchase can also be made online at their website, link as below. Free postage for Semenanjung address and only RM6 for Sabah & Sarawak address. No.19, Jalan Meranti Puchong D25@Meranti Puchong, 47120 Puchong, Selangor.